Special Mate Tackle Boxes are truly an innovative option for hanging lure storage. All lures can be accessed quickly, and are presented in full view, by merely flipping the dividers just like turning pages in a book. No more peering down into dark cubicles trying to determine which compartment holds the lure you are seeking. Once you try one, you will never go back to a regular tackle box. Special Mate Tackle Boxes are available in three heights: 13-inch, 8-inch, and 5-inch. This 13-inch Muskie/Pike box comes only with crankbait dividers, while the two smaller boxes may be purchased with either crankbait or spinnerbait/spoon dividers installed. 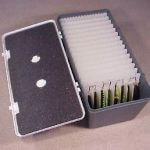 This largest of the Special Mate boxes contains 9 ribbed dividers, with 5 compartments in each divider. It will hold 45 large crankbaits, jerkbaits, or similar large lures up to 12″ in length. The box measures 23″ long, 11″ wide, and 13″ high. 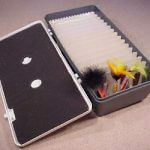 Special Mate Tackle Boxes are truly an innovative option for hanging lure storage. All lures can be accessed quickly, and are presented in full view, by merely flipping the dividers. No more peering down into dark cubicles trying to determine which compartment holds the lure you are seeking. Once you try one, you will never go back to a regular tackle box. Crankbaits, spinnerbaits and spoons can be easily stored, eliminating the tangled mess that often occurs in many tackle boxes. Each box has two strong steel latches, and a folding handle for easy carrying. The underside of the lid is lined with foam padding to secure the lures in place when the box is closed, and small drain holes in the bottom of the boxes allow water to drain away from the lures. The boxes are two-tone, with a white lid and a Gray bottom. This 5-inch box comes fitted for crankbaits and jerkbaits, while other Special Mate boxes may be purchased with either crankbait dividers or for spinnerbaits and spoons. This box is made for standard smaller crankbaits, jerkbaits, and similar sures. It has 15 ribbbed dividers to keep the lures from getting tangled with 8 compartments to each divider. It will hold a total of 120 lures up to 4″ in length, and measures 22″ long, 11″ wide, and 5″ high. This 5-inch box comes fitted for spinnerbaits and spoons, while other Special Mate boxes may be purchased with either crankbait dividers or for spinnerbaits and spoons. This box is made for standard sized spinnerbaits and spoons. It has 15 dividers, with 15 grooves in the top of each divider. It will hold a total of 225 lures up to 4″ in length, and measures 22″ long, 11″ wide, and 5″ high. This 8-inch box comes with crankbait dividers, while other Special Mate boxes may be purchased with either crankbait or spinnerbait/spoon dividers installed. This box is made for standard sized crankbaits, jerkbaits, and similar lures. It has 15 ribbed dividers…to keep the lures from getting tangled with 8 compartments to each divider, and holds a total of 120 lures up to 7″ in length. It measures 22″ long, 11″ wide, and 8″ high. This 8-inch box comes fitted for spinnerbaits and spoons, while other Special Mate boxes may be purchased with either crankbait dividers or for spinnerbaits and spoons. This box is made for standard sized spinnerbaits and spoons. It has 15 dividers, with 15 grooves in the top of each divider. It will hold a total of 225 lures up to 7″ in length, and measures 22″ long, 11″ wide, and 8″ high.